My fascination with reincarnation began while I was a trainee nurse. I was allocated three terms on geriatric wards and although slightly unusual, I was happy to care for the elderly. Their life stories and experiences had me spell-bound on many occasions. Whilst training as a nurse, I was assigned three rotations of geriatrics; two male and one female. It was while on one of the male wards that this event happened. My night shift started at 9 pm and after the usual updates from the day staff, my colleague and I were left to care for the old gentlemen. One gentleman took my hand as I fluffed his pillows. Thinking he was in a confused state, I just made sure he was comfortable and continued with my tasks with the other night nurse. The two of us administered medicines and settled the patients for the night, then turned most of the lights off. Our desk was situated at one end of the ward so we hear and see all the beds. For several hours we took turns in attending to patients needs, writing out reports and taking vitals. At about 3:30 am, the gentleman who had spoken to me, passed away. After the doctor had been, I attended to his body. After cleaning and wrapping him in a sheet, as is the custom, I left him for an hour and went to write my report. Later with everything in place, I watched the day staff arrive. One nurse was carrying a bunch of daffodils – yes, I was very shocked. The reason not only because of what the old man had said but also the fact that it was the midst of winter, much too early for daffodils. I gently placed the yellow flower between the old gentleman’s hands, just the way he had described. He had told me he had ‘seen’ this happen and knew he was going to pass away. It had given him peace to thank me for my kind thought. As to how he had ‘seen’ this event before it happened, I have no idea, but I did want to ensure it was done. Although this was not the first time I had experienced strange events of a spiritual kind; I had seen a ghost at the age of ten; it was the catalyst for me to start researching. Whether you believe in reincarnation or life after death or not, the subject is fascinating. Today researching this or any other subject is easy with the internet but at that time it was visits to the library and reading through numerous books to find the details, events and research I wanted to feed my curiosity. I look down into the still glassy water and see an old face, deep down I know it to be my face, and the deep lines creasing my eyes, cheeks and mouth are at the same time familiar and alien. Dark brown eyes and skin are in contrast to my hair, which was once a shiny ebony mantle but now streaked with silvery grey, hair now thin and wispy in one long plait down my back. Splashing my face with the icy cool water, I look up to see the tepees across the stream that feeds the lake and raise my old body upwards. I’m only good for collecting wood, minding the children and cooking. My days past slowly. Without a husband, I have to ingratiate myself to my daughter’s brave, be of help so I can have a place to sleep, tucked into the side flaps, under my buffalo bedding. Walking back the horror of that far day comes back, maybe it’s the similar setting, the crispness of the air but I ‘see’ the riders coming over the hill, the crack of the guns and the sudden screaming, startled me. The soldier’s were yelling and laughing as they rode through the camp, shooting my friends and family, everyone they see fleeing. I was helpless to stop them, I’d screamed back but was too far away. Fear stops me running toward the murderers but my heart breaks as I watch the massacre. Crouching under a bush I covered my ears until long after the screaming and pounding hooves had ceased. Too scared to move I waited until nightfall before walking back to a blood soaked and burnt earth where my home had once been. I hadn’t noticed I was walking as the horrors around me had numbed my body and mind. The land was silent and still as though shocked and sadden as was I. Whimpering coming from the far side of the camp leads me gradually in that direction. To my utmost joy I found my grand-daughter but my grief had sprung into my heart as I saw she is huddled underneath my own daughter’s body. Taking her up into my arms, other sounds around me come to my ears as one by one the women and children uncovered themselves and crawled out of their hiding places. This past will never leave me and I wait for my time to come when I will be with the spirits and my husband, who had fought so bravely on that fateful day against an enemy so cowardly and strong. The firewood is weighing heavily now as I enter the camp and I smile at the last of the Lumbee tribe survivors. My feet hit the icy floor, as I swing them over the bed’s edge, the cold chills my body very quickly even though I try to dress as fast as I can. Mother is already gone from the little attic room we call home. Tying my long hair into a bun, I walk quietly and swiftly down the long back stair case. The warmth and noise hits me as I enter the kitchen, cook’s voice shouting orders, the pan’s being filled with water, eggs being boiled and bread being cut. Cook is a hard task master so I run straight to the scullery cupboard to collect my brush and bucket. Quiet as a mouse I walk into the great rooms upstairs and start cleaning out the fire grates, laying out new kindling and on to the next one. I must be careful to be swift and unnoticed by the Lord and Lady, their graciousness to let my Mother stay after the disgrace of my coming; it must never be forgotten or taken for granted. Being our Lady’s favorite hand maiden had made all the difference to my Mother staying or being thrown out, once her pregnancy was discovered. I was put to work as soon as I could be taught to polish the silver ware, sitting at the servants table hour after hour. Our precious day off once a month was time for Mother to show me the outside world and let me play in the huge grounds and gardens. Mother didn’t tell me about my Father until very recently, when I think it was more of a warning away from men. I had noticed a young gardener the month before whilst walking through the walled garden and his eyes seemed to penetrate my very being. I hadn’t noticed that Mother was still walking ahead and that I was rooted to the spot, staring back into those wonderful eyes. Her voice made me jump and look toward the sound. Catching up to her as she strode purposely on she started to tell me her story. She too had been entranced by a young gardener in this very walled garden and quickly became obsessed with him. Every month they would meet in secret and he told her of faraway places and his adventures. Swearing his love for her and the promise of marriage she succumbed to his wiles. Another month and he was gone without a word and quickly she realized her condition. Lady Havalore did send men to find the rogue but he was long gone and no one knew of a young man called Ted Franks, it probably wasn’t his real name anyway. Mother continued her duties as long as was possible and after my birth did as many of her duties as she could between nursing and comforting me. Luckily I was a quiet contented baby and my little crib was set in the scullery during the day for warmth. Looking at the grand ornate gates I can see the letters of the manor’s name but cannot read them; reading and writing are for our betters not the likes of us. The smell of the cattle, the steam from their bodies mingles with the morning air. Waking early, I am excited knowing father is taking me to the town today. The trip will take most of the day on the cart, which is filled with grain, vegetables and trailing two cattle, all of which father will sell for cloth and other supplies. Leaving Mother, my brothers and sisters for more than a day is such a treat. There are advantages to being the oldest but I have a feeling father has an ulterior motive in taking me. Last autumn he had encouraged me to visit Bayard in his father’s butcher shop. A match between us would be a favorable match for our farm and their butcher shop. I really enjoy the ride into town with so much of my life spent around the farm, escaping to see the different views and smells is wonderful as well as having no chores to do. Father maneuvers the cart through the dirt streets and to the rear of the butchers shop. I can feel myself become hot and nervous, Bayard is so handsome and I hope my appearance is pleasing. Just as I think about him there he is at the door in a blood splattered apron greeting us with a wave and a smile. Lowering my head I glimpse Bayard come to the wagon to help father lead the cattle to the little shack at the rear of the shop, he will slaughter them later I’m sure. Watching him walk away from me, his muscular body makes me flush. “Wilda, move yourself.” Father’s shout makes me jump, so grabbing a sack of sawdust I enter the shop’s rear store and greet Bayard’s father with a quick nod and place the sack upon the floor. The air is full of the smell of meat and blood mingle with the sawdust scattered there. I have become accustomed to the smell over time. At first it clawed at the back of my throat and stayed within my nostrils, now it is a reminder of Bayard and I have come to love it. Sitting quietly while my father talks, I watch Bayard through the veil of my eyelashes imagining him oblivious to my staring. However as our father’s leave the store, he turns smiling and asks if I would like a drink, keeping my head lowered I gently nod. 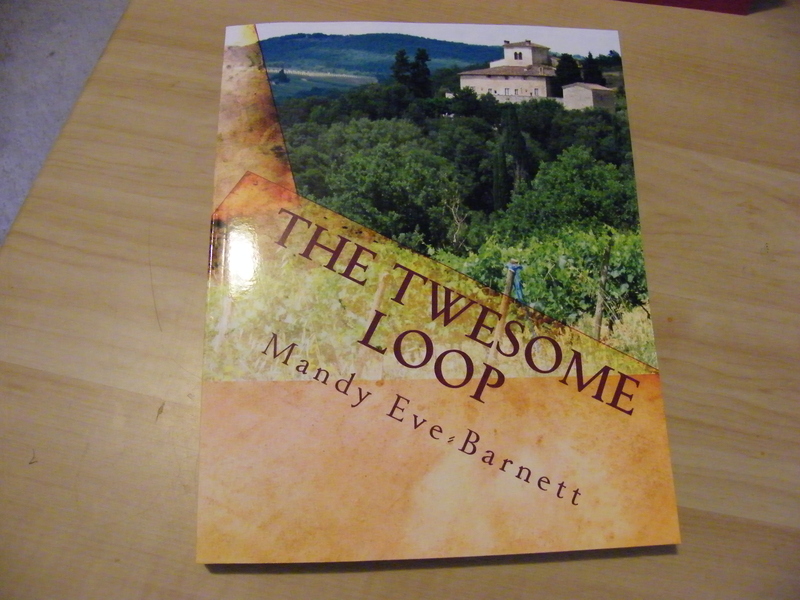 My novel, The Twesome Loop has a reincarnation theme weaved between southern England and the Italian slopes outside Rome. The narrative follows four main characters who find their souls mates in another lifetime. Have you had experiences you can relate? I had been on the fence about reincarnation until a few years ago. Two of what I believe to be my past lives have come back to me but only tidbits. Nothing substantial enough to actually look up, except for a Pagoda house in Japan. During WWII I remember I was from Germany and somehow went to Japan to be with my Nazi fiancee and I remember standing in front of the house. A few days after I remembered this I googled and found the place. Wow that’s fascinating Courtney. Keep notes when something occurs to you – it will come eventually if you let it. Thanks for dropping by & the reblog. Oh that’s interesting – care to share one or two? I do believe, but don’t care to share publicly. Thanks for dropping by Gerri – it is appreciated.